Occasional Toronto: February Theme: "Tired"
The February theme for the City Daily Photo Blog community is "Tired" and I posted this pic to show you what I am tired of - Winter! 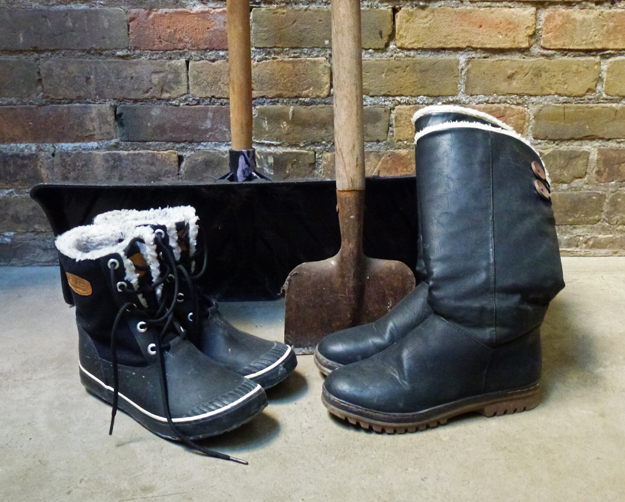 I'm tired of wearing boots, shoveling snow, and chopping ice. Can't wait for the warm spring days ahead. Taking part in the theme Tired. Click HERE to see more examples of Tired from around the world. Hello, I am with you and being tired of winter. I am glad February is a short month. Come on Spring! Happy Thursday, enjoy your day! Oh my gosh, I don't blame you at all! Great photo! When you put it that way, I would have to agree! Love those boots. Maybe I could trade you a pair of sandals for a pair of boots? Nah, then we'd have to change the places where we live. Fun post! Oh yes, I can see you are tired of shoveling snow and ice. Spring is only about two months away. Hang in there. And I can't get enough of it! Wow! I've only had to shovel snow twice this winter and both times the amount of snow we got was almost inconsequential. I agree with you...I am tired of it as well. I can only imagine how tired you get of cold, snowy weather. About the same, I guess, as we get tired of breaking out in a sweat 5 seconds after we step outside in July here in the southern United States. Wonderful take for the theme! Wishing you warmer weather soon. Nice twist of tiring. Can feel your point. Both boots look nice and comfy as well as sturdy to provide good support. I'd like to have the ones on the left. Forty-four more days until the first day of spring today, (on the calendar) if of course mother nature decides it's time for spring. Oh please mother nature gift us all with spring again, please! I don't blame you at all, RedPat. Come on down!